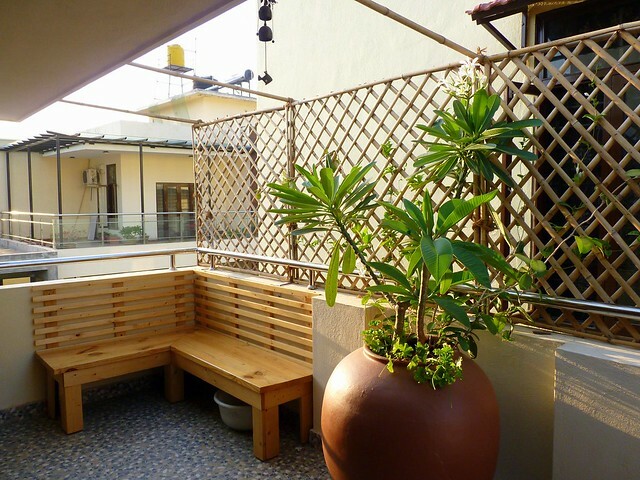 Wondering how to make the most of your small balcony / deck / terrace in the city? 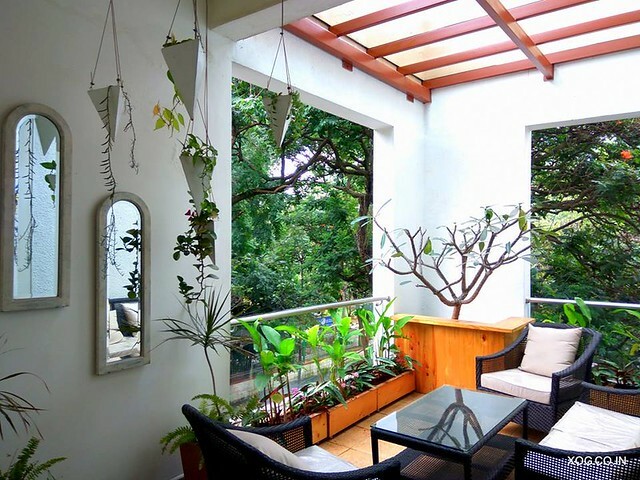 These pictures of balcony gardens from real apartments will inspire you to get started or seek professional help (details inside). 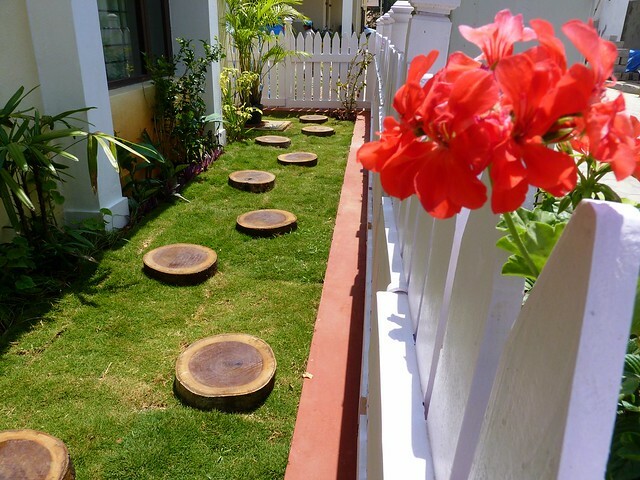 In this follow up series featuring Xanadu Organic Gardens, there are more landscaping and garden design ideas for your home. Over the weekend, I saw first hand the ease of maintaining an artificial grass lawn. Needless to say, the bed looks lush green throughout the year. This got me thinking into turning a part of our terrace into a tropical retreat lush with grass and Frangipani trees. Featured below are garden installations of all sizes from from a large one with picket fencing to several green nooks around the house. 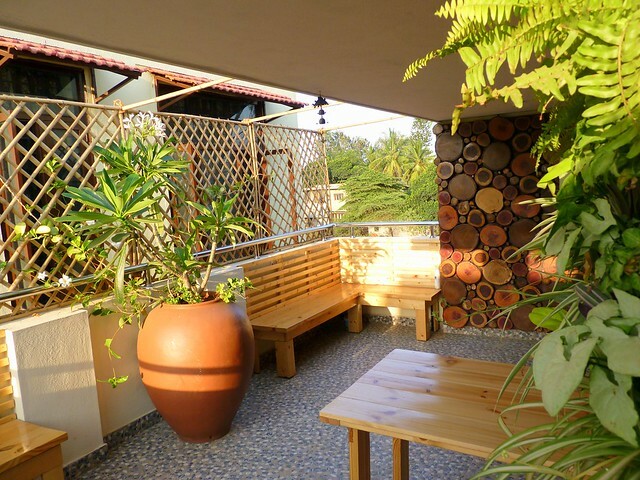 In an independent house or villa, you will often see a green corner in several levels of the house like a backyard, planter box, sit out, porch. 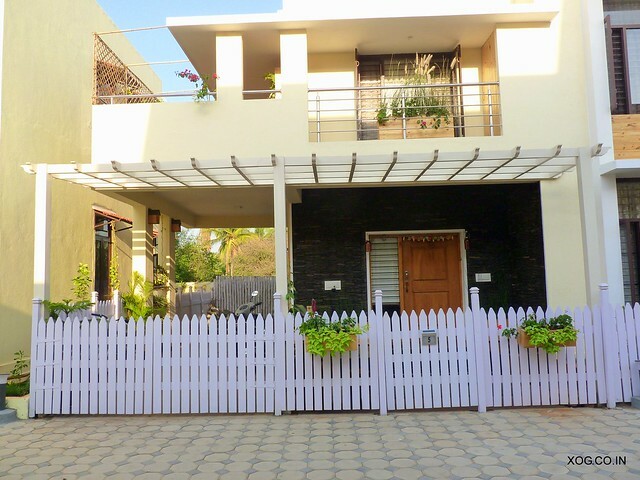 Use a picket fence to create visual interest. These are available for ready installation in most garden stores. You can choose o hang geraniums in hanging pots on the fence. The front yard was laid with Mexican grass and border plants. Trunk slice stepping stones lead you around the garden so you can explore all it’s lovely features. Use a bamboo trellis either in its natural form or painted in white to create a privacy screen. Use flowering flowering creepers from a large terracotta pot for some dash of colour. 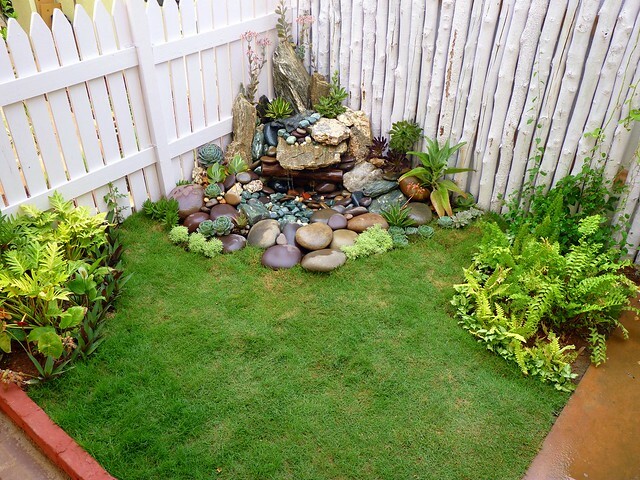 The back yard was given a burst of life with a succulent rock garden, pole wall, tropical beds and a Mexican grass lawn to chill out in. The questions in this post are focused on the services offered by Xanadu. So, if you are looking for someone to set up your garden and are wondering what the timelines and cost look like, read on. 1. Do you assist in maintenance after installation of the gardens? The vast majority of the garden installations we do are setup for beginner gardens. The plant selection is perennial, hardy and requires minimal maintenance with watering only 2-3 times per week. The potting mix we use is a mix of organic materials which is low weight and holds water longer than the typical red mud. This makes re-potting less frequent and maintenance easy to do. Upon completion of the garden installations, we give the clients a practical workshop on how to care for and tend to their new garden with easy care and maintenance instructions for each plant and container. We return to the gardens in two weeks post installation to do a free maintenance session to ensure that the plants are doing well and the clients are happy with their new green spaces. We also offer free remote consultations for any issues which the clients may face with the gardens, such as pest management, including home remedies which they can whip up easily and apply. We offer garden services on call when needed as well as annual maintenance contracts for gardens which we have installed. We are currently servicing a few gardens on maintenance contracts with our trained staff. 2. 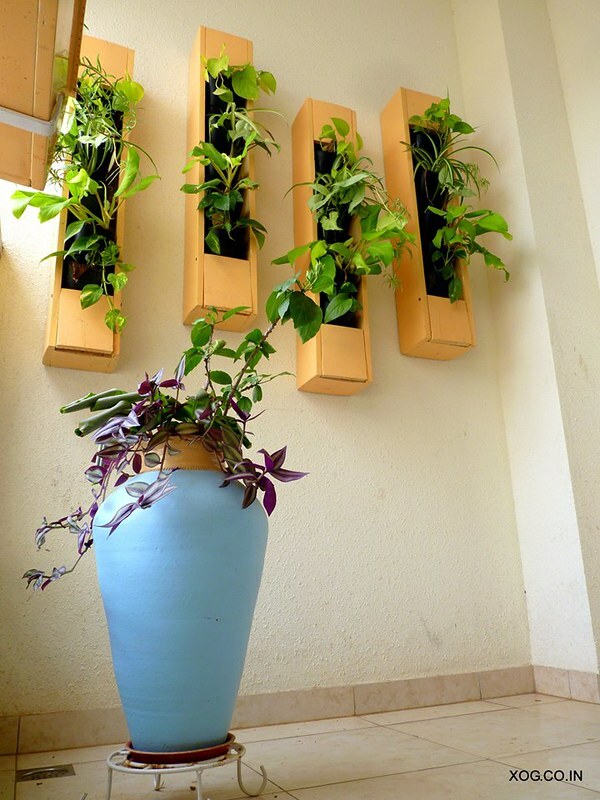 Can you give a generic idea of pricing for let’s say a 9* 12 balcony garden? We do not have square foot rates as most of the gardens we do are custom made tailored to the client’s tastes and the needs of the spaces. 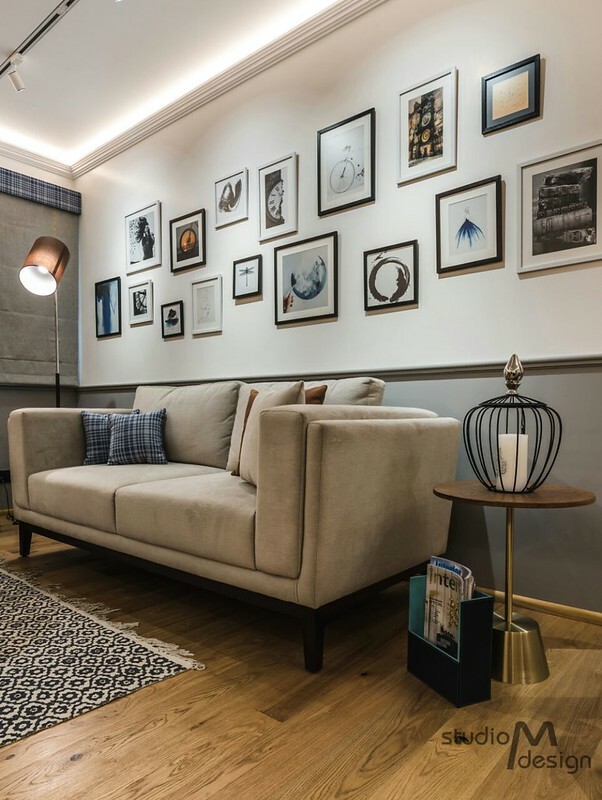 However, our clients typically tend to spend an average of Rs. 30,000 on 2 balconies in a typical apartment. 3. What are your timelines like for installation? We manufacture the vast majority of our own products which are custom made to the needs of the project. The project build takes between 7-14 days followed by a modular installation at site over a day or two which includes ready-made products with potting mix and plants. The installation is neat and efficient in a plug n play modular format. 4. How long have you been around and how many gardens have you installed to date? We have been around for 5 years this September and have installed over 100 gardens. 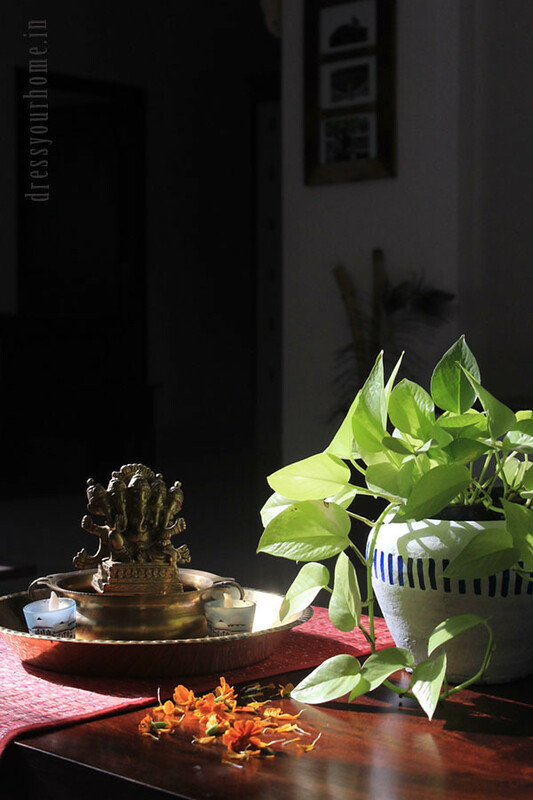 If your balcony receives less light then choose greens that survive in shade like some variety of crotons, African Violets and Pothos. 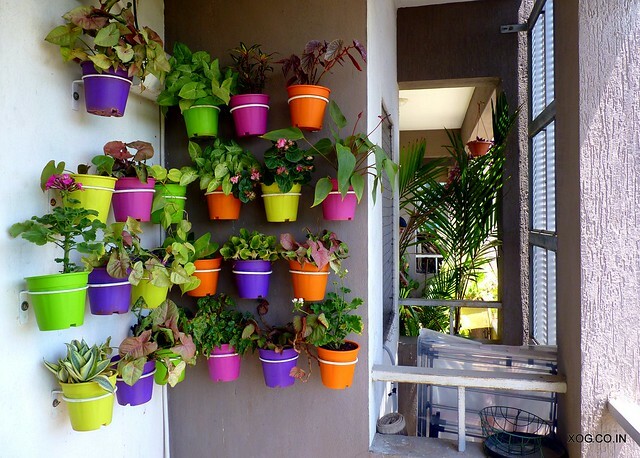 Plant them in colourful planters so they don’t look drab and bring in the colour.